From left Crowe & Dunlevy attorneys Jimmy Goodman, Ryan Wilson, Tim Sowecke and William Moon pitched in to help a heroes client with more than free legal advice. Some people ask why I “dig” public service work. 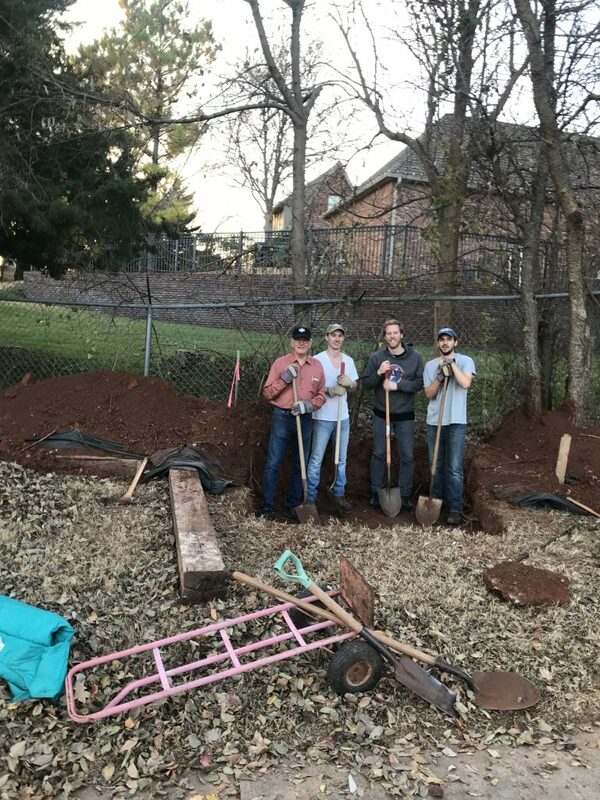 Professionally, we use pro bono as short for pro bono publico, which loosely translates to “for the public good.” So pro bono is then service “for good.” This story is about digging for good. It is shared with the hope it will renew or inspire an urge to do more pro bono by all OBA lawyers, but especially the young ones who have sharper minds – and stronger backs. Recently – well, in May 2017 – Margaret Travis referred to me a pro bono matter for an Oklahoma veteran under the OBA’s veteran assistance project, Oklahoma Lawyers for America’s Heroes Program. We are assisting him in seeking redress from his neighbor due to a water flooding problem he is having – that he claims is due to the actions of his neighbor. It has been quite a long process in trying to work this out for him. I am sure this is representative of the variety of non lawyer services that all Oklahoma attorneys wind up providing during the course of their work for veterans – albeit a unique one. You’ll find more info about the program at www.okbarheroes.org, and please find your own way to go digging for good.